Skills and Abilities: Trained hand to hand combatant from birth as a prince of Wakanda. T’Chaka the 2nd is the son of T’challa the king of the African nation of Wakanda and Storm, African goddess, thief and leader of the X-men. Born on Earth-1119. After years of training and as first-born child to the throne of Wakanda he underwent the trails necessary to become the black panther. After completing the trails he ingested the heart-shaped herb found only in Wakanda which endowed him with superhuman abilities. T’challa retired and he became the official Black Panther the protector of his people. On many of his adventures he was accompanied by L-10 a cybernetic lion who may or may not have been created by him [Exiles vol.2 #1]. Despite not displaying any powers he was detected as having the mutant X-gene [Exiles vol.2 #2]. He became unhinged from time when he confronted Klaw his fathers deadliest foe. In this instance he was vaporized along with his pet L-10 [Exiles vol.2 #1]. After he disappeared his father T’challa came out of retirement and killed Klaw. He was succeeded as Black Panther by younger sister Sh’ri who went on to become the greatest Black Panther ever. 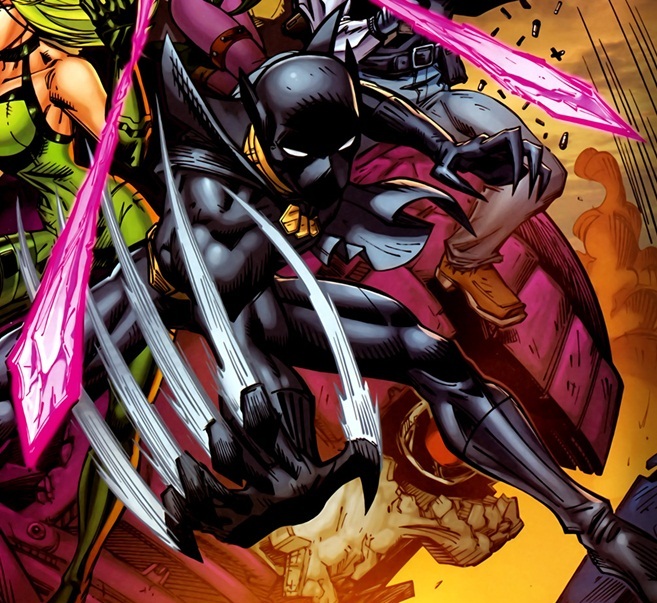 As a member of the exiles he was teamed with Blink, Beast, Forge, Scarlet Witch and Polaris . They were tasked with repairing various timelines [Exiles vol.2 #1]. On their first mission to a world controlled by the mutant master of magnetism Magneto. Here he revealed his identity to his teammates. After successfully completing the mission they were sent to a machine world [Exiles vol.2 #2-3]. They managed to aid that world as well before heading back to the world from their first mission [Exiles vol.2 #4-5]. After breaking up the alliance they returned to Morph. Alongside his team they disrupted the Talus and found the ponopticron. Inside they met with Heather Hudson and saw Prince Gambit and his team suspended in animation. They continued to operate as exiles after hearing the true nature of their job and how it helped stabilize existence from a female Kang [Exiles vol.2 #6]. He and Polaris often flirted and on many trips through time women often threw themselves at him. He is noted as having a more whimsical and happy-go-lucky personality allot like Spider-Man in contrast to his fathers stoicism. I have not followed BP and Storm continuity consistently for several years. Are these kids biological between the two of them? Seems like a lot of powerful kids developing in a marriage that in the real world only happened 6 years ago. Usually comics time is glacial, not sped up. Alternate time line children. Biologically theirs but from the future. Corn rows?!? Seems more american ghetto than african royalty from the future. And the costume hasn’t changed much.